I’m happy to be coordinating a huge study of Long-billed Curlews this spring across 3 states. Since early April I’ve been working with a dedicated graduate student, 9 field technicians, and countless supporting/collaborating partners in each of 7 study areas. During the first 10 days of May, our local team worked hard to capture and band 10 adult curlews in our study area west of Boise (the Long-billed Curlew Habitat Area of Critical Environmental Concern), including deploying satellite transmitters on 4 new birds. A few days later it was time for me to begin a fieldwork-oriented road trip in order to capture adults and deploy additional transmitters at our other 6 sites. I left on May 13 and returned to Boise on June 3, having visited many beautiful places and worked with many great people along the way! From the evening of May 13 through late afternoon of May 14, 4 of our dedicated curlew technicians (Ben, Erica, Hattie, & Sarah) assisted me in capturing 5 adult curlews and we deployed a transmitter on a new adult female. Ben had already found ~10 nests in the area by the time we arrived but on the morning of the 14th we located 3 new nests before resuming trapping – a great morning! Our newly transmittered bird, CT, joined the ranks of the other Pahsimeroi birds, Goldie and Borah. We had initiated work at MPG during May 2014 but had disappointing/inconsistent results from the hand-me-down transmitters we deployed. In 2015 we were hoping to recapture the birds from 2014 to deploy new, more reliable transmitters. BUT, we found fewer curlews in 2015 and were only able to find 1 of the 2014 curlews (a female named “Parking Lot Dave” :-). Fortunately Sarah had been able to find her nest so, once we arrived from the Pahsimeroi, we quickly captured her and outfitted her with a shiny new transmitter! We had less luck with her mate as a storm prevented us from an early evening attempt and when we tried early the next morning, he flushed at the last second (“noooooooo!”). I had to shift focus to a point count survey training for the next 5 days (great fun in the beautiful Swan Valley of Montana) and I returned on Friday late afternoon hoping for a 2nd attempt at Dave’s mate. When we arrived to the vantage point we saw what I was afraid of (no 2nd chance to catch him) but what was also REALLY COOL to see: 2 chicks had just barely hatched and the other 2 would hatch by the next morning. So, we were treated to an across-valley view of the pair tending their newly hatched chicks! Our elation at this event was soon ruined as Sarah saw a lot of coyote activity in the nest area a couple days later and then never saw chicks again – proof that raising young curlews is a tough gig in today’s world! After striking out on a 2nd visit to MPG, I decided it was time to head to the most distant study site – one of our new sites for 2015, situated near Cody & Powell, Wyoming. I had been here in mid-April when delivering Eric & Jeremy to the site and meeting local contacts, Brian & Carrie Peters with The Nature Conservancy’s Heart Mountain Ranch Preserve and Destin Harrell with BLM. It’s a gorgeous area that also holds some different habitat relative to our other study sites – a mix of bunchgrasses, low sage, and some cactus. These habitat features, especially the sage and tall bunchgrass, meant that this was a more difficult place in which to find nests. In my career as an ornithologist, I have found curlews to be the most challenging species I have studied in terms of the effort/skill it takes to find their nests. They nest in the open on the ground and are thus quite wary when human observers are close (especially within ~200 yards) so we’ve learned to watch from a distance at key times of day. But this habitat increased the challenge as the bunchgrass (taller than usual because of a wetter 2014 growing season) and sage combined with the subtly rolling terrain made it really difficult to observe curlews from far away. 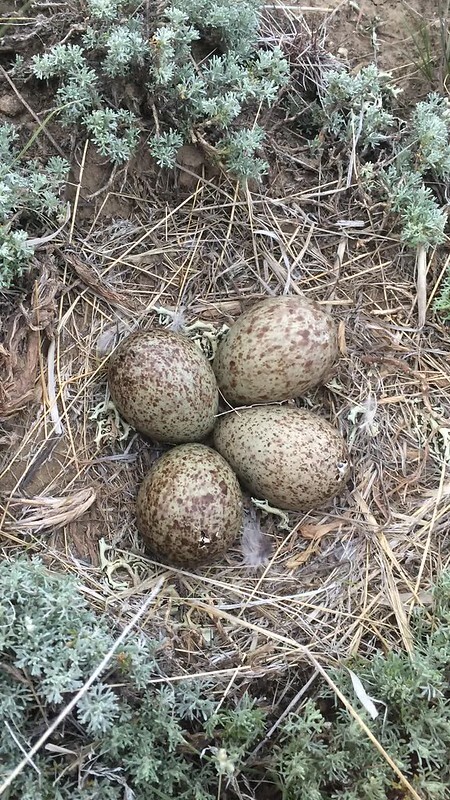 Thus, even though Eric & Jeremy were finding moderate densities of curlews in a couple areas (Heart Mountain Ranch and the Polecat Bench area), including numerous pairs, finding nests was proving difficult. Fortunately they had found one at Polecat just a couple days before I arrived so on Monday we headed out to capture the female. This ended up being my most shocking capture experience of the season as when I knelt down to corral the female after she jumped into the net, my knee and both wrists went right into clumps of prickly pear cactus – ouch! Fortunately adrenaline didn’t let me feel the pain until after I had a solid grip on the female but I was pulling out the broken tips of spines from my knee weeks later :-) We were rewarded with some excitement when we came back a couple days later to catch and band the male – 2 of the eggs were starting to hatch and we could actually hear them chirping! Needless to say, we hurried to band and process the male as quickly as we could so he could get back to his nest ASAP. Eric and Jeremy had recently noticed a large gathering area for curlews near where they were staying on the Heart Mountain Ranch – a field with a tall mix of alfalfa and grasses. We continued to see this each evening and morning and realized that many of the females nesting on the slopes of Heart Mountain were coming here for the evening/night, presumably for food and cover, and then heading back to nesting areas in the early morning. Another fun thing we noticed was variability in poop color :-). Previously I’d mostly seen some variation from greenish to grayish but across the 4 birds we captured in this area, we saw a wide variation – including 1 bird with mostly reddish poop. Dr. Eric Atkinson, a local colleague/collaborator teaching at Northwest College in Powell, suggested maybe it was from eating some of the numerous grasshoppers in the area and this seemed the best explanation. With the help of TNC, in 2014 we had been able to deploy a transmitter on a female curlew at the Flat Ranch Preserve that TNC supporters voted to name Henrietta. We were excited to be able to get more details about curlews in this area in 2015 – including extensive abundance surveys throughout the Henry’s Lake basin and Shotgun Valley, nesting success information, and adding 2 more transmitters. Erica and Hattie had started the nest-searching season with a bang and one of the really cool things they documented was that 2 nests they found each had 5 eggs – something we hadn’t yet seen. One of these was Henrietta’s nest and catching her mate was a high priority once I arrived here. Fortunately their nest was relatively close and catching her mate proved to be pretty straightforward – thus, it was great to arrive in the afternoon and have deployed a key transmitter by nightfall! We spent the next couple of days searching for nests in the Shotgun Valley where, like over in the Cody/Powell area, sagebrush made long distance visibility difficult. Our efforts paid off and we were able to trap a female on the Trude Ranch and set her up with a transmitter. During the rest of my time here we were foiled by several rain squalls but we still ended up able to catch the birds we needed to. As with all other sites, local partnerships have been crucial to our success and enjoyment on this project – TNC, IDFG, BLM, and the local Master Naturalist chapter all played important roles in our work in the Henry’s Lake area. In 2014 we had deployed a transmitter on a single female on the National Elk Refuge, named AJ, and she had the most unique migration of any of the curlews in our study to date – long stopovers during both fall and spring migrations and she traveled much further south in Mexico than our other tracked birds. I was excited to have funding from the Meg & Bert Raynes Wildlife Fund and the Wyoming Governor’s Association Big Game License Coalition to deploy 2 more transmitters in the Jackson area: 1 more on the National Elk Refuge and 1 on Grand Teton National Park (GTNP). I really hoped to be able to find AJ’s nest and deploy a transmitter on her mate so I was excited when Erica (who had agreed to volunteer her weekend helping me in Jackson so she could see the Tetons) found her nest! But, a combination of thunderstorms and bad luck led to a day and a half of the worst trapping success I’ve ever experienced – and had me scratching my head and pleading for luck to return! First we had a female flush very early from a nest in GTNP, likely because of some raven and raptor disturbance we saw while getting ready. Then a storm foiled our attempt to catch AJ’s mate that evening. We tried for him early the next morning and he flushed at the last second (another silent “noooooo!”). We decided to shift back over to GTNP and actually had some good luck for a spell in which we located 3 new nests (making for 4 nests plus at least one other pair from 1 vantage point – an impressive density of nesting curlews!) over the course of a few hours but then continued our bad luck in capture by failing on our first 2 attempts. Finally, on our most distant nest, we succeeded in catching a large, and fortunately cooperative, female! We still needed to deploy a transmitter on the National Elk Refuge and, so far, we’d only been able to find a single nest – AJ’s. Her mate was the curlew I most wanted to catch but would we be able to catch him with a 2nd attempt or would he flush early? I was stressed and unsure how best to go about it but, with council from my main partner in Wyoming – Wyoming Game and Fish Department biologist Susan Patla – decided that it’d be worth an evening attempt since maybe he’d be more likely to stick on the nest when settling in for his nocturnal incubation duties (he’d flushed in the morning when he knew AJ was around and getting ready to spell him). So I was able to quickly pull together an all-volunteer team and give it a try. Figuring I had much less than a 50/50 chance, we went for it and my heart was pounding as we approached his nest. We had the net right over the nest area but couldn’t see him so we hesitated in lowering the net … Suddenly he flushed at an angle but barely flew into the last panel of the net. “YEEEESSSSSSS!” I even did a little skip on my way in to corral him in the net as I was so relieved to have captured this guy :-). It was fun to celebrate with the dedicated volunteers that had helped, including Jennifer & husband Mike, Mark and his daughter Emmie, and Mary – all of whom had witnessed multiple failed capture attempts and were very deserving of some excitement! Jay handing AJ’s mate (“CL”) to Emmie Gocke; National Elk Refuge, Wyoming. Daniel, Wyoming: This was the last stop on my 3+ week journey and I was looking forward to seeing the curlew activity in this new-to-us study area. The flood irrigated pastures in the Daniel area support the largest known curlew population in Wyoming. This population was first studied in the early 1980s as part of a master’s thesis and our 2015 field season was an opportunity to revisit this historic study as well as deploy transmitters in a new area. I had 3 transmitters to deploy and hoped to be as efficient as possible; thus, I was none too happy when yet another thunderstorm put an end to trapping plans on my first evening in the area (June 1). I needed to get back to Boise by the 3rd so this meant the 2nd was going to be a busy day! We started around 6am for some nest searching on a ranch where the crew, Kevin & Mikki, had just recently been granted permission to search and monitor. It was a happening first couple hours as we found 4 new nests, including 1 that was hatching that morning! We didn’t finish work until almost 9pm, after capturing 5 adult curlews and deploying transmitters on 2 females and a male – possibly the most productive day on this curlew study for me with 4 new nests and 5 birds captured. It was an epic day during which I appreciated the hard work of my field technicians and my colleagues with Wyoming Game & Fish as well as the interest and enthusiasm of several private landowners I was able to meet. Susan Patla, Wyoming Game and Fish Department, with our first curlew of the day in Daniel. Landowner Sue Briggs Stanfill holding “ET”, our second transmittered bird of the day, near Cora, WY. Help us name our ACEC curlews! The time has come to choose names for our other two curlews that live on The Long-billed Curlew Area of Critical Environmental Concern near Emmett and Middleton! We’ve already named our pair, Thor and Valkyrie, thanks to Middleton High School. Now we have a male and a female, EP and CP who still need names. These two are not paired together, but both have nests on the Long-billed Curlew ACEC area. “EP” shows off his transmitter. What will his new name be? Students from some Idaho schools have come up with name options for these birds. Let us know your favorite name! 5th grade students from Perrine Elementary voted for the names Colton and Caterina the curlews. Polls are closed! The winning name for CP was Gem. Congrats Emmett High School! The winning name for EP was Canyon. Congrats Emmett High School! Jay and Heidi recently attended the Partners in Science National Conference in San Diego, CA. We were invited to attend because of IBO’s work mentoring a Boise teacher. As part of a fellowship from the M.J. Murdock Charitable Trust, local teacher Lindsey Lockwood from Sage International School has been working with IBO to conduct scientific research. During the conference, Lindsey presented her research on songbird population trends at Lucky Peak to an audience of fellow teachers. She hopes to integrate what she has learned through this fellowship into her lessons in the classroom. Aside from watching Lindsey present (she rocked it!) we also got to network with a variety of researchers and teachers from across the US. After the conference ended, we decided to head out into the desert toward the Salton Sea, where “Frank” one of our Long-billed Curlews has been spending the winter. With GPS coordinates in hand, we headed for the field where Frank’s most recent signal came from. As we arrived, we saw a few curlew heads poking out of the alfalfa! We scanned the field for any signs of an antenna poking out of the vegetation, but didn’t see any birds with transmitters. It’s possible Frank was in the field hiding, but he may have already taken off for the morning to other foraging grounds. It was fun to imagine that the curlews watching us from the field had spent the night roosting with Frank, and to think about where these birds may have come from. Were any of them also from the ACEC? Moving on toward the Salton Sea (where Heidi’s lifer Yellow-footed Gull awaited) we ran into many fields with foraging curlews. Here’s just a sample video of what one of these fields looks like. Even though we didn’t get to see Frank himself, it was amazing to see such large numbers of curlews spending time in these fields and observe some of their wintering behavior. As we left the Salton Sea area we wished them well…soon they will begin their migration north toward their breeding grounds! A few of you may have noticed that we haven’t had any updates on Venus, one of our ACEC curlews, in quite some time. Unfortunately, Venus died on the Long-billed Curlew Area of Critical Environmental Concern (ACEC) study area during the last week of May. We launched an official investigation of her death with the Idaho Fish and Game’s Wildlife Health Laboratory, and so haven’t been able to share the news until now. Read on for the rest of the story, and the conclusions of her autopsy. We are saddened to lose Venus (and the monetary/time investment that went into attaching her transmitter) but we hope that her story will help bring attention to the plight of her fellow Long-billed Curlews on the ACEC. We are also sad to share this news with the Community Cub Scout Pack (#255) of Middleton, who visited her home this spring and chose her name. Toward the end of May, we began to get a signal that Venus’s transmitter had not moved. As always we were concerned, but we were out of town attaching transmitters on other curlews and so were not able to go check on her right away. We became even more worried when realizing that the crew had last seen her with recently hatched chicks but hadn’t found her on the last couple visits to her territory. In 2013 we strongly suspected that one of our curlews was shot, and he was killed just days after his chicks hatched – when curlews are the most defensive of their territory, most visible, and most likely to loudly approach humans that are near their chicks. With her risk of being shot elevated, we feared the worst. This was not just a transmitter glitch. When we finally made it to the ACEC in June, we found what we had expected: Venus was dead. There was no sign of her mate or chicks anywhere in the area. Since chicks of a young age are not very mobile, we assume that her chicks died and her mate fled (he did not have a transmitter, so we will never know but it’s possible that the male continued to care for the chicks). Because of the hot summer weather, there wasn’t much left of her, but thankfully we were able to recover Venus’s transmitter unharmed. After some debate, we decided it would be worth it to collect what was left of her body to investigate the cause of death, though we were not hopeful that any evidence remained so long after her death. We contacted Mark Drew from the IDFG Wildlife Health Laboratory and he kindly offered to do an autopsy for us. This month, after rigorous testing, x-rays, and a careful necropsy report, we have the results. Venus was killed by a gunshot wound to her upper chest. In the past, we have seen several shot curlews on the ACEC and several others where we suspected foul play. By having a transmitter on Venus, we were able to find her body relatively quickly and retrieve the necessary evidence to show that she had been shot. Her death highlights a gap in community awareness that needs to be filled. While shooting of ground squirrels and some other species is legal on the ACEC, Long-billed Curlews (along with many other bird species on the ACEC) are protected by the Migratory Bird Treaty Act. This means the person who shot Venus committed a federal crime. Many who use the ACEC do not realize that it is an Area of Critical Environmental Concern, or that it is illegal to shoot curlews or other birds that live there. We hope that we at IBO, along with your help, can develop a partnership to change this through education and outreach – to the recreationists who visit this area and to the communities surrounding the ACEC as well as in other places in Idaho where illegal shooting of wildlife occurs. After a couple of weeks of fund-raising and other office work, I happily jumped at a chance to get out for a couple days of woodpecker surveys on the Boise National Forest. I needed to stretch my legs, I hadn’t heard or seen a Black-backed Woodpecker in about a year, and – this is important – there were no World Cup games on the schedule for 2 straight days so I had a perfect window in which to get out! I waited until after the US-Belgium game ended on Tuesday afternoon so I got a late start heading out and arrived to camp around 11pm. I was awake a little after 5am the next AM to start a steep hike along the Riordan Lake trail to reach my first survey point around sunrise. Surveying for birds in a new area is always exciting for me and of course there’s always the hope of seeing other wildlife on the trail. The partly burned forest surrounding the creek and Hennessey Meadow made for a great backdrop and the meadow itself supported a diverse riparian bird community, including Fox, Lincoln’s, and Song Sparrows; Dusky and Willow Flycatchers; and more. On my 5th survey point I had an almost immediate response from a Black-backed Woodpecker and soon there were 2 individuals – a good start! I ended up detecting one more Black-backed and also observed four other woodpecker species (Downy, Hairy, Northern Flicker, and Red-naped Sapsucker) and other fun birds like Olive-sided Flycatchers. After my long hike down, I drove back towards Warm Lake in order to get lunch and find some WiFi access so I could finish work on submitting a proposal before heading back out to my next site. As I got alongside the lake, I saw an adult Red-necked Grebe carrying a chick on its back – how cool! Thus, I was already fully content with my trip sightings before heading to my second site. My drive that evening took me through miles of burnt trees and it was daunting to think about how large of a fire this was … but also how much habitat this had created for species like Black-backed Woodpeckers, Olive-sided Flycatchers, Mountain Bluebirds, and even American Robins – all of which reach higher densities in burns. As I drove up the final road, the wind picked up because of a nearby thunderstorm and I hoped no trees would blow down to block my passage in or out! Fortunately, the storm and wind soon subsided. I arrived around 830pm and was more than a little dismayed to find a large and hungry greeting party of mosquitoes! After psyching myself up, I started walking around in search of a good flat place to set up my tent and was swatting mosquitoes constantly – not thinking about birds at all and not carrying binoculars. Then I looked up and saw a bird-like shape on the side of a snag – my heart jumped a bit because of the apparent shape but then I reasoned it had to be one of those thousands of pieces of loose bark hanging off the trees in the area. Then I saw its head turn and I said to myself, “No way!” before stumbling/sprinting my way back to my car to get binoculars, scope, and camera/phone attachment for the scope. A Northern Hawk Owl! I’d been so preoccupied with biting insects that I hadn’t really noticed that the habitat had a boreal nature to it and was similar to other places where I’d seen Hawk Owls … it’s just that I was 250+ miles from the nearest known breeding area. I hurried to snap a few documentation pictures before the sun disappeared. While I was observing the bird, I noticed that it was hanging around the same area and even gave a couple of quiet vocalizations. It made me curious about how long this bird had been here and was it possibly occupying a territory? But, the mosquitoes soon drove me to set up my tent and seek refuge. Thus, I hurriedly set up my tent and crawled inside – and basked in the excitement of an unexpected sighting of such a charismatic bird! I’d only just started to relax when I heard a high-pitched screeching – I knew I’d heard this sound before and it was when I’d seen fledgling Northern Hawk Owls in Glacier National Park (closest known breeding area) a few summers ago! I knew I wouldn’t have much time to look in the morning as I had woodpecker survey duties so I raced out of my tent. I soon saw an adult in a different area and it flew over me towards the main activity area – this bird was noticeably bigger than the other adult so I must have originally been seeing the male and this was the female! I soon confirmed a view of at least a single fledgling and thought I heard another – but I didn’t want to intrude any closer to pursue the other bird. I had just confirmed breeding Northern Hawk Owls well over 250 miles from where they’ve been documented to breed previously! I was too excited to sleep for a while so it was another short night and I was awake again before sunrise for woodpecker surveys. After my first point, I took 15 minutes to try for a few more pictures before I continued on my woodpecker transect. I was quickly rewarded with seeing the male capture, kill, then cache a songbird (I’m pretty sure it was a Yellow-rumped Warbler but hard to tell in the low light)! I heard a juvenile beg once but apparently dad didn’t think junior was hungry enough :-) The lighting was still terrible but I tried for a few more pics before moving on and was lucky enough to get this video of a juvenile playing with a branch (!) and a couple other pictures. The following evening, Larry & Missy Arnold “chased” these birds and confirmed 2 fledglings; thus, 2 adults and at least 2 fledglings! The story gets even better … on the way back home, they stopped to move a fallen tree out of the way and Missy looked up to see another Hawk Owl miles away and a little exploration turned up a total of 2 adults and 3 fledglings. I was excited at seeing one bird and blown away to have documented nesting … but 2 nesting pairs a few miles from each other is mind boggling! It’s such a remote area with relatively few biologists and birders so it’s hard to know what to make of this. Have they been there in prior years, just unnoticed? Or is this a relatively recent colonization event? One Hawk Owl came to Moscow, ID this past winter and we wondered then if that was an isolated event or if others had possibly arrived to more remote areas of Idaho. I don’t think we’ll ever know for sure but future study of this phenomenon might be worthwhile going forward. … and caching it behind some bark! Northern Hawk Owl territory on the Boise National Forest – might that split-topped snag be where the nest was? The male spent a lot of time near it. *Because of the rarity of the species (especially rare is evidence of breeding in the state – I know of only one other breeding record in Idaho), their confiding nature, and the potential for foul play, I’m reluctant to post the exact location or directions on a public forum. I trust all birders but just don’t want to inadvertently mess up a good thing by letting the info get into the wrong hands. I don’t know all details but >10 years ago there was a pair w/ fledglings in N Idaho and some birders worried they ended up shot & I don’t want the same result. Late last week I started to notice that something was amiss with Borah’s transmitter – in technical terms, the activity counter data was “stuck” which suggests the transmitter wasn’t moving. My heart sunk – in the 3 prior times this had happened, we found a dead curlew (one in which we strongly suspected foul play, 1 predator kill, and 1 unknown cause). Of course I care about all of these curlews but Borah had migrated to Mexico and back last winter and we’d just recently captured his mate (“Goldie”) so I feel a little extra for Borah and really didn’t want this to be the same result. On Tuesday I made the 5+ hour drive from Boise to his breeding area on Big Creek Ranch, decidedly nervous about what I would find. I had texted with ranch co-owners, Molly & Tom Page, the night before and they were going to be there at the same time and generously offered to help me search – a relief for me b/c finding a small transmitter in a vast grassland can be tough even with the tracking gear! I thought I might have 4 helpers (Molly & Tom and their children, Lilia & Henry) but I ended up with 7 because Molly’s sister Ann Fuell was visiting with her 2 children, Kate & Ted, and they were excited for an outing. What a bonus! Once we met up, they enthusiastically asked, “what do we do?” I suggested we walk straight towards their nesting territory because if Borah was alive and their nest was still active, he’d surely appear. Part of the family search party, heading out to find Borah’s transmitter. As we neared the nest, I could see a female (longer bill) standing in the vicinity of where the nest was and as I looked closer I could see, but not read, the plastic leg band (“alpha flag”) and suspected it was Goldie. Not long afterwards a screaming curlew appeared – as it flew towards us I could see it was a male by bill shape/length and then I saw the leg band and was hopeful. There was no antenna from a satellite transmitter which could suggest Borah was alive and had shed his transmitter – I just needed to read the alpha flag with certainty. On his next fly-by I could clearly read the letters “AU” and I breathed a huge sigh of relief – this was Borah and he must have dropped the transmitter. Likewise, once the female flew towards us I could see her antenna and read her 2-letter code. Borah, very much alive! Showing off his back with no antenna, and about to swallow a food morsel. Adding to my excitement is that both Borah and Goldie were exhibiting the aggressive and defensive behavior that happens when they are protecting chicks! I was dive-bombed several times and I think Lilia & Henry were wondering if Goldie might actually hit one of us :-) Needless to say, I’m pretty sure these 2 curlews don’t share the same affection for me! We then turned our attention to finding the transmitter. This consisted of waiting for once-a-minute messages from the receiver to deduce direction & distance. It took a while but we eventually got “warm” as we neared the headwaters of the creek (which flows into the Pahsimeroi River). The family had previously agreed that extra s’mores would be the reward for whoever found the transmitter while I would just be happy to find it in one piece and try to figure out why it had fallen off. Before long, Kate said, “hey, what’s this?” and I was relieved once again – an intact transmitter on which the Teflon harness material had worn down so it fell off the bird. It was only a few feet from the creek so maybe Borah was bathing at the time? Lucky it hadn’t fallen in the stream because my understanding is that if the antenna is underwater, the unit won’t transmit and we wouldn’t have been able to find it at all! The bad news is that we won’t be able to track both Borah and Goldie in the same migration but I’m thankful that Borah survives and will cross my fingers that they raise the chicks to fledging and that Goldie goes somewhere exciting this winter! Thanks a ton to the Pages and Fuells for assisting with the search and for helping make my trip that much more worthwhile. While out nest searching today, I watched a pair of curlews land next to each other in the distance. At this point in the season we get excited anytime we find a female, because they are very hard to locate once the incubation period begins and they sit nearly invisible on the nest for virtually all the daylight hours. Right after the pair landed, a coyote ran toward them from the west. As the coyote came over the hill, the male curlew took off and flew across the draw to the east of him. The coyote stopped a few feet from the female but watched where the male flew to. The male landed near the bottom of the east side of the draw, seemingly trying to lure the predator away. After landing he began making an unusual chirping call I had never heard before, but one that sounded very similar to the call curlews use when they are with their chicks. As soon as the male began to call, the coyote immediately ran in his direction. It seemed that the coyote knew that that noise should mean there would be some curlew chicks nearby! The coyote disappeared in what seemed like a pursuit of some chicks and the male successfully distracted the predator from discovering the nest. Shortly after the coyote left, the female made her way over the hill to her nest, revealing its location to me. What really amazed me was to realize that the coyote had passed within meters of their nest! This pair’s nest makes the 6th for the 2014 season so far so stay tuned for more curlew updates in the next few weeks!